While here in New York City, the antennas we cover tend to sit atop skyscrapers like the World Trade Center, for much of the American landscape, the tallest fixtures are spindle-thin television towers that keep watch over an agrarian landscape. But the view from atop those towers can be just as beautiful as the view from a $100 million Manhattan penthouse, as this drone video proves. 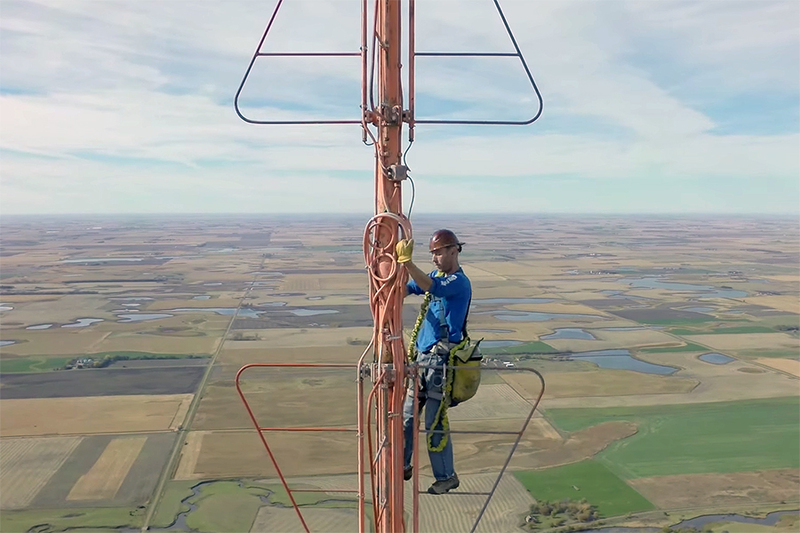 A day on the job for project manager Kevin Schmidt involves scaling a 1,500 foot television tower to change a lightbulb. A vertigo-inducing video of the climb shot by Schmidt’s colleague, Todd Thorin, using a Quatrocopter drone sent pulses racing and went viral on YouTube—and for good reason: it’s stunning. Shot for Thorin’s aerial photography and videography startup, Prairie Aerial, the footage shows Schmidt’s painstaking climb, rung by rung, as the ground becomes increasingly distant and the buildings mere pinpricks.